iPod to iPod transfer is a common problem that many users may want to solve. Many people are wondering how to solve problems like how to transfer music from iPod to iTunes library, how to transfer music from one iPod to another iPod, and how to transfer photos from one iPod to another iPod. In fact, it is not hard to deal with this issue. You can make use of various methods to help you to copy photos to iPod in case you need. This guidance will show you several effective solutions to assist you to make it. If you just want to transfer a few pictures from one iPod to another, you can make use of Email to make this goal come true. The detailed steps are as follows. 1. 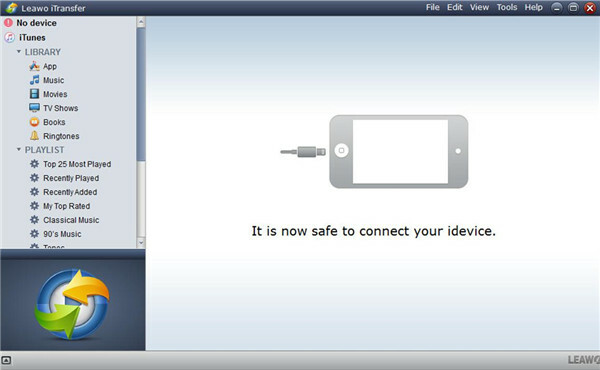 On your iPod, click to open Photos app and then choose several photos that you want to transfer to iPod of your friend. Click the share icon in the interface. 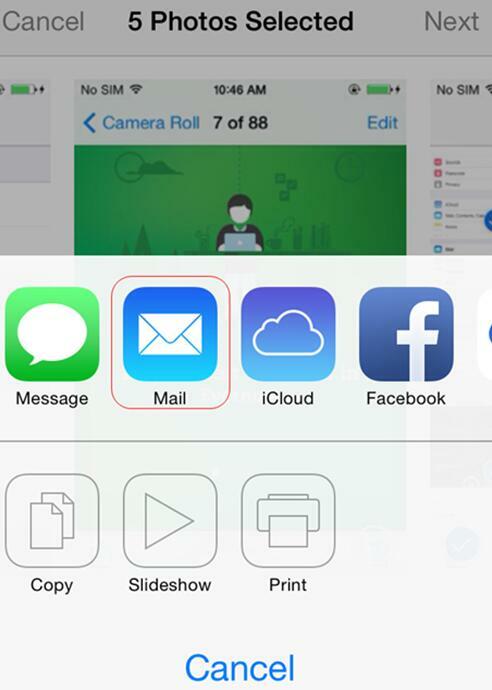 Choose Mails application from the diverse ways. 2. Fill in the information in the next panel and then you can click the “Send” button to the email address on another iPod to realize iPod to iPod transfer. 3. 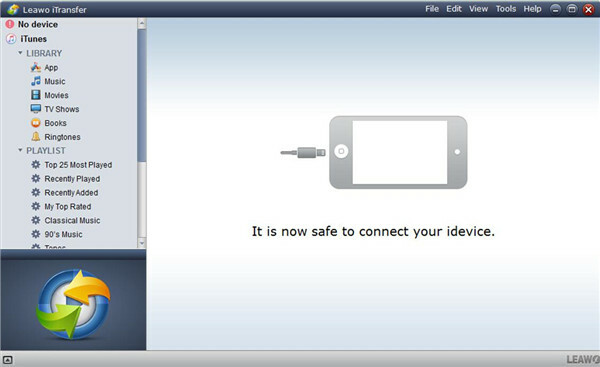 On another iPod, navigate to open the new email to download the pictures to iPod. Thus, you can completely solve how to copy photos to iPod from another iPod. This method has a limitation on the photo sizes. If you want to send lots of photos to another iPod, this solution is not a good choice for you to use. 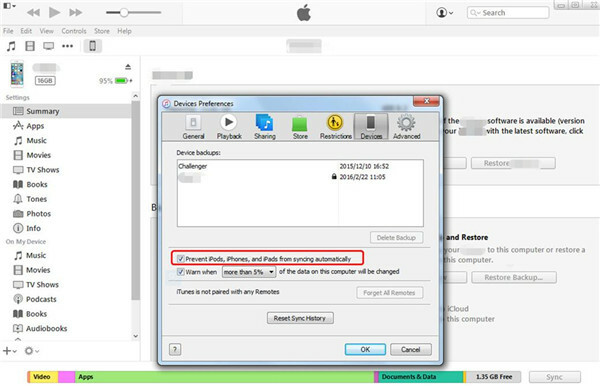 You can continue to read other ways in this tutorial to help you to realize iPod to iPod transfer. You can also turn to iTunes for help. This is a good method and it is also free of charge. 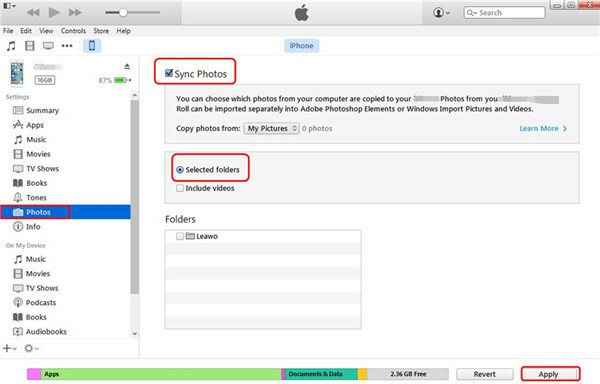 Now let’s begin to have a look at the detailed steps to copy photos to iPod via iTunes. 1. Start iTunes on your computer and make sure it is the latest version. Navigate to “Edit > Preference > Devices” and choose the option of “Prevent iPods, iPhones and iPads from syncing automatically” to check. 2. Plug your iPod into computer with the matched USB cable. The iPod will be recognized as an external hard drive by computer. 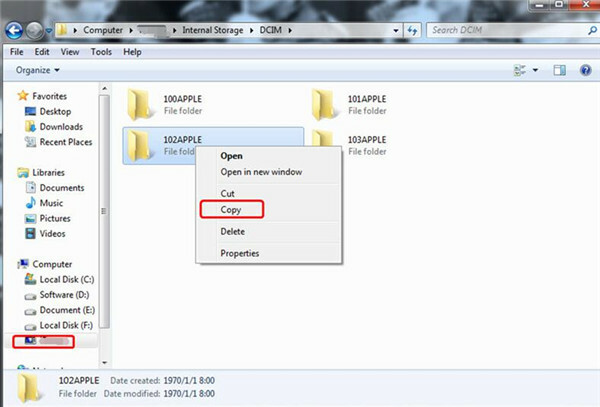 Open the iPod icon on your computer and find the photos folder. Afterwards, you can copy and paste the photos to computer for later use. 3. Connect another iPod to computer with proper USB cable. Click the new iPod icon in the interface of iTunes and then choose to click on the “Photos” tab under the menu of “Settings > Summary”. Tick “Sync Photos from” and select “Selected Folder” to locate the computer folder that contains the iPod photos you have just exported. 4. Tap on the button of “Apply” in the interface. Thus, the iPod photos will be synced to another iPod successfully. This method to transfer to iPod from another iPod is not tough to handle. If you are not fond of this solution, you can choose other ways in this post to help you to make iPod to iPod transfer come true. Actually, SNS apps can also be used to copy photos to iPod from another iPod, like Skype, Facebook and WhatsApp. 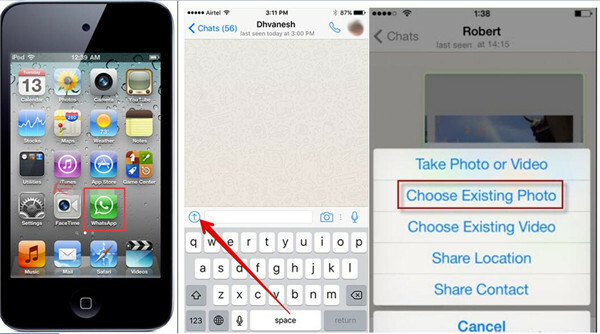 Here I would like to take WhatsApp for instance to tell you how to transfer to iPod easily. You can check the detailed steps in the following contents. 1. On iPod home screen, click the WhatsApp to open it. Then you need to click on the “Chats” button at the bottom of the screen. You can choose the existing conversation with the target iPod contact number. You can also choose the contact of another iPod to create a new conversation. 2. Click on upward arrow in the bottom of the interface. In the pop-up menu, you need to select “Choose Existing Photo”. Afterwards, choose the iPod photos that you want to send to another iPod. 3. 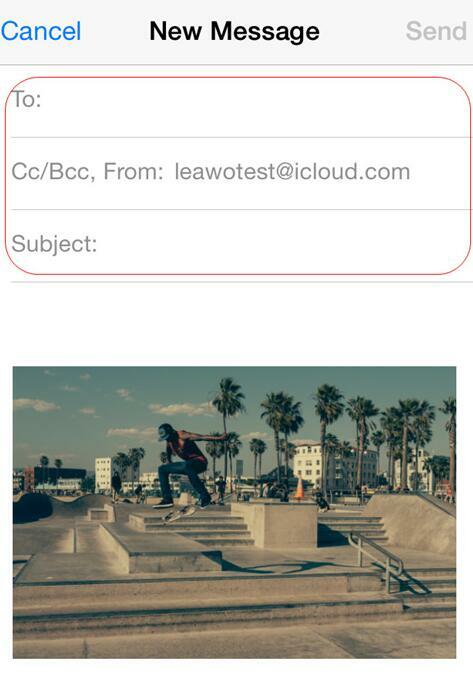 Click the “Send” button at the upper right corner of the interface. After that, pick up another iPod to download the photos. Thus, you can copy photos to iPod from another iPod easily. You need to make sure both iPods are connected with good Wi-Fi network. If you want to make use of a kind of more professional iPod to iPod transfer software to realize the goal, you can check out the contents in Part 4. If you are just seeking for a professional tool to help you to copy photos to iPod, Leawo iTransfer may be your best choice. This software has powerful features and the performance is with high efficiency. You will definitely fall in love with this iPod to iPod transfer software once you have a try. Now let’s check out the step-by-step process to see how to realize iPod to iPod transfer. In order to realize iPod to iPod transfer, first you need to export iPod photos to computer for later use. Start this iPod to iPod transfer software on your computer. Connect iPod to PC with matched USB cable. The program will recognize your iPod automatically. Move to click the button of “iPod icon > LIBRARY > Photos” to choose the pictures you are willing to transfer to another iPod. Right click on one of the photos. In the pop-up menu, choose “Transfer to > My Computer” to click on. In the next panel, you need to click “Change” to set a computer folder to save the exported iPod pictures. After that, click on “Transfer Now” to begin to transfer iPod photos to computer. The process will last for a few seconds. Wait until the process is over. When you have exported iPod photos to computer, you need to import the photos from computer to another iPod via iPod to iPod transfer software — Leawo iTransfer. Unplug iPod from computer and then connect another iPod with computer via USB cable. Tap on the new iPod icon and then choose the tab of “Photos” under the menu of “LINRARY” to click on. Afterwards, click on the “Add” button to choose “Add File” or “Add Folder” in the next menu panel. 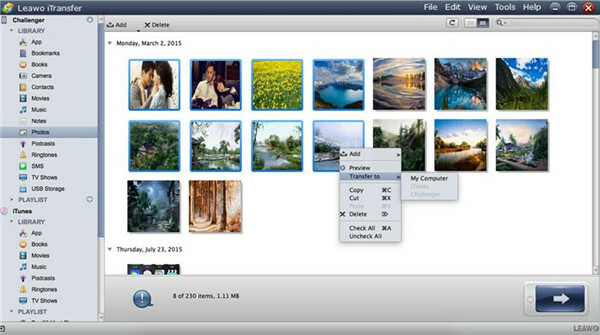 Browse your computer to locate the exported photos on computer to click the “Open” button to add them to iPod. Wait for several seconds until the process is over. 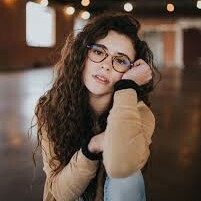 By comparing the listed methods to solve how to copy photos to iPod in the above, you can reach the conclusion that Leawo iTransfer is the most secure and accurate program for you to take advantage of.